The capacity of the Left to successfully confront the far right’s continuing political ascent will be severely tested in 2019 in the only country in the world where the decade-long crisis of neoliberal global capitalism swept a radical left party into government: Greece. 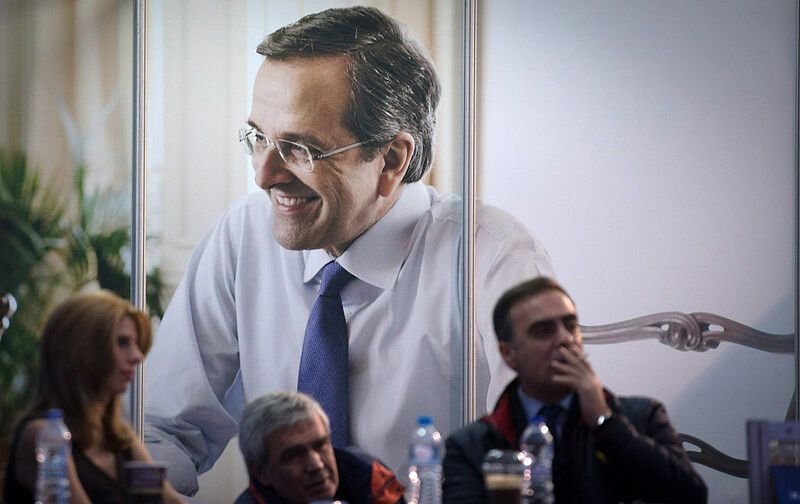 There was a very rapid passage from euphoria to disappointment on the international left when the Syriza government elected in January 2015 was forced by the European Union and the International Monetary Fund (IMF) to succumb less than six months later to a further austerity bailout package, despite a referendum rejecting a similar creditor proposal by over 60 percent. Despite this, the Syriza-led government was reelected later in 2015 and now approaches the end of its term. Having just this year finally secured the ending of the long sequence of neoliberal austerity memoranda imposed continuously on Greece since 2010, it now faces, in the run up to the forthcoming election, a main opposition party which has fully embraced the hard turn to the Right elsewhere. Emitting the all too familiar ugly dog whistle of “losing ethnic identity due to migration,” the New Democracy party now amplifies social tensions amid a toxic mixture of neoliberal and reactionary policies and outlandish conspiracy claims — even, most recently, claiming that Syriza’s moves to secularize the Constitution would lead to a ban on Christmas. The far-right tack New Democracy has taken reflects a situation where, however much public expenditure was hamstrung by the austerity memoranda, Syriza’s attempt to democratize certain aspects of public life in a state with a long reactionary history has been substantial. This has included legislating a path to citizenship for migrants, as well as for their children born in Greece, securing the right of civil union and child fostering for LGBTQ couples, and guaranteeing full access to hospitals for all, including undocumented workers. Moreover, the Syriza-led government reactivated, staffed and overhauled the state agency responsible for scrutinizing labor relations and working conditions which had fallen into a state of vegetation in the pre-Syriza period, during which various illegal employment practices flourished, as well as introduced numerous very innovative systematic policies to relieve the humanitarian crisis caused by the 25 percent drop of the country’s GDP. Most recently, after a broad public consultation, there has been the advancement of constitutional reforms for securing proportional representation and new popular referenda initiatives, making it mandatory for the prime minister to be an elected member of parliament (in order to avoid another technocrat-led government in the future), and introducing term limits for MPs, including the removal of their immunity from prosecution protections for fraud and corruption. Perhaps most significantly, while reinforcing the constitutional ban against the privatization of university education, it would constitutionally underwrite the Syriza government’s efforts to finally secure the separation of church and state in Greece. This secularizing of public sector institutions is a crucial political task which has until now remained a pipe dream for Greek progressives. These basic yet decisive steps towards democratization are a clear indication that despite its shortcomings, Syriza is the only force in the country with the political capacity to overmatch the far right that has been coming to power elsewhere. It was the rise of Syriza, in the face of the initial electoral successes of the outright neo-Nazi Golden Dawn party earlier in the decade, which kept the rise of the extremist far right in Greece at bay, at least relative to other European countries during a similar period. But now, after three consecutive losses to Syriza (in two elections and the referendum), it is New Democracy which has taken up the mantle of the far right. Extreme reactionary views have always been a part of New Democracy, although before gaining power in 2012 it appeared fairly moderate on social issues. Its new leader as of 2016, Kyriakos Mitsotakis, the son of a former prime minister, was viewed at the time as a choice that, despite being nepotistic, would signify a shift back towards a more liberal agenda on social issues. However, under his leadership, New Democracy has made a hard turn to the right on every level. Reactionary views are being propagated by the leadership, either directly through Mitsotakis himself or through Adonis Georgiades, one of the party vice chairs, or the parliamentary representative Makis Voridis. This duo is infamous for their “activist past,” whether as an axe-wielding “fighter against the Left” in the case of Voridis, or as a promoter of Holocaust-denying literature in the case of Georgiadis. With their xenophobic nationalism and anti-human rights rhetoric, they have shifted the mainstream of the party towards the far right. The rhetoric which has become more and more prevalent at New Democracy’s recent party congresses — bearing an alarming similarity to that of the Civil War years — was heard as well at the counter-protests to a recent antifascist speech by Tsipras in Thessaloniki. Perhaps not surprisingly, all this has emboldened Golden Dawn to actually set out terms for a possible coalition government with New Democracy. Belying certain remaining vague liberal rhetoric in its platform, New Democracy has voted against every piece of equal rights legislation introduced by Syriza. At the same time, the party has ever more fully embraced the harsh neoliberal agenda imposed by the creditors during the memorandum years. This is an important distinction since even the previous governments headed by New Democracy never actually fully presented the EU-imposed neoliberal austerity in positive terms, claiming that a large portion of the imposed neoliberal reforms were not the party’s preferred policy. Now however, in a toxic mixture of neoliberal and far-right conservative policies, the party is calling for the harshest measures, even in the current new period where the bailout programs of neoliberal imposition have ended. New Democracy’s loud promise to reduce “illegal immigration” ominously signals returning to the pre-2015 practices of mass deportation and sinking of refugee vessels in the Aegean. Advancing the idea of a privatized Chilean-style “personal piggy bank” pension plan (which is openly saluted by New Democracy as a measure imposed by Pinochet) is part and parcel of its campaign for a neoliberal weakening of the public sector through privatization and cuts throughout the public service. Particularly ironic is its embrace of the austerity policy of only one new hire for every five layoffs in the public sector just as the Syriza government has secured a ratio of one-to-one, while at the same time pledging to keep the approximately eight thousand priests as public servants. This would reverse a recent agreement the Syriza government secured with the church leadership, whereby priests would lose public servant status, a small but important step towards a more secular state. The question for progressive forces is quite clear. There’s no denying that the Syriza period has had its fair share of disappointing moments. As with those who recognized the failings of the Workers Party (PT) in Brazil, yet turned back to it in face of Bolsonaro, many people who were critical of the Syriza government will end up voting for it. And in Greece, the result of this is much more likely to succeed in preventing the election of the reactionary right. The end of the memoranda allows Syriza to pave a much clearer path to progressive reforms which lie ahead (including a minimum wage increase and the return to free collective bargaining, as well as constitutional separation of church and state), showcasing the sharp contrast between its political program and that of a New Democracy increasingly speaking to and for the far right in the country. Despite not living up to the high expectations that it gathered in 2015, Syriza remains not just the only viable choice to ensure even minimum social and human rights standards, but to halt the rise of neofascism in one more European country. While the election of New Democracy itself would be a big blow to democracy in Greece, there exists an even larger danger, that of shifting the hegemonic range of “acceptable” public discourse even farther to the right, inevitably yielding an even stronger and more legitimized presence of Golden Dawn and other openly fascist political players, while at the same time breeding fascist practice on the social level. To be sure, if this is to be more than a temporary defensive victory against the forces of reaction that all capitalist societies are currently spawning, Syriza still needs to become the party so many of its activists and supporters once hoped it would be, but that it never quite was, even at its best. Indeed, both in the run up to and during Syriza’s period in government, democracy and extra-parliamentary life of the party were diminished, while Syriza’s previous attempts to create organic relations between social movements and parliamentary representation started to devitalize. It must reinvent its capacity, as a party, to think, educate, mobilize, and act as a radical progressive force in society as well as an agent acting to secure and support a Syriza government. Above all, Syriza needs to reengage with and invest in the further development of the social movements, in ways which did not happen when it first came to power in 2015. The movements themselves must also play a crucial transformative role of both their own capacities and goals as well as their relation to politics and the government. This is needed to sustain social pressure and protest while at the same time opening new roads for progressive legislation and reform. This is the only sure way for Syriza to reinvent itself and avoid complete integration into the existing state apparatus as a typical social-democratic party, and instead bring about transformation of the state institutions so as to make them agents of economic and social transformation.